Welcome to Walking in Snowdonia. 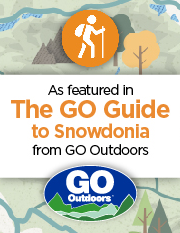 This site contains a selection of walks in Snowdonia along with wet weather ideas, a hill recognition quiz and tips on mountain safety. All the information on this site is provided with no guarantee as to its accuracy, and visitors are reminded of the BMC participation statement which states that "climbing and mountaineering are activities with a danger of personal injury or death. Participants in these activities should be aware of and accept these risks and be responsible for their own actions and involvement." Please note that GPX files made available for download have simply been drawn on to a map and may not always follow the exact line of a path on the ground, or necessarily the best route around any given obstacle. If you have Quo mapping from Mapyx (free download) you can download all the routes on this site. The site has recently undergone a face-lift and now includes Google maps and new photos. Some of our route descriptions have been updated too. I hope you find the information on this site useful and please feel free to contact me with any suggestions. Please use the menu to the left, or click on an area / marker in the map to navigate the site.